The Government's suggestion that councils remove speed bumps to improve air quality is starting to unravel after it appeared unable to provide evidence that such a move would have overall benefits and the UK's leading transport research body questioned its rationale. Ministers' latest national air quality strategy suggests 'Improving road layouts and junctions to optimise traffic flow, for example by considering removal of road humps', as an alternative to charging Clean Air Zones (CAZs). Last week, in a letter to environment secretary Michael Gove, senior figures from three campaign groups challenged Mr Gove 'to provide any evidence held by your Department that the removal of speed humps would improve air quality, and that this outweighs any possible public health disbenefits due to increased road injuries and fatalities'. Invited by Transport Network to state what its evidence was, environment department Defra did not cite any evidence but stated that councils should continue to ensure road safety is not compromised by any changes. 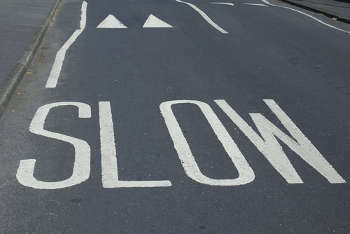 Tim Barlow, technical manager, air quality and emissions at TRL, told Transport Network: 'TRL’s research has shown that traffic calming measures can cause an increase in harmful tail pipe emissions and CO2, with speed humps tending to have the largest increases. The letter Mr Gove is signed by Stephen Joseph OBE, chief executive of the Campaign for Better Transport, Joe Irvin, chief executive of Living Streets, and Roger Geffen MBE, policy director of Cycling UK. The campaigners criticised the Government for ignoring its own evidence that charging CAZs are the most effective means to address the issue. Mr Geffen told Transport Network: ‘We don’t know what evidence Defra had that removing speed humps will be effective in tackling air pollution.’ He accused the Government of ‘ignoring good evidence on the one hand and a lack of evidence on the otherhand’. The campaigners also argue that the Government has misinterpreted guidance from the National Institute for Clinical Excellence (NICE). That guidance advises councils to 'consider' both '20 mph limits without physical measures' and 'using them to encourage drivers to maintain a reduced, steady pace along the whole stretch of road, rather than road humps that may increase acceleration and braking-related emissions'. Separately, TramForward, the campaigning arm of the Light Rail Transit Association, said it is ‘disappointed’ that the Government’s strategy deals only with cutting nitrogen dioxide from vehicle exhaust as particulate matter is also extremely damaging to health. It said that while the proposed measures may well cut down particulate as well as nitrogen dioxide emissions, they will do nothing to tackle the other major source of particulate pollution – wear of tyres, brake linings and road surfaces – which has been dubbed the ‘Oslo effect’.